At an altitude of 4200' Sedona has an ideal climate year 'round: 10 degrees on average cooler than Phoenix, and 20 degrees warmer than Flagstaff (at 7000' altitude). This high desert climate has four mild seasons and minimal precipitation. Late summer features monsoon-like electrical storms. Snow? In winter, we get snow 3 to 5 times lasting 1-2 days. This is the best time to photograph the white snow and red rocks against a blue sky! Millions of years ago this entire area was covered by a sea - seven different times! When these seas retreated, the extensive erosion helped carve the unique mesas, buttes, spires and pinnacles that you enjoy photographing today. These layers of deposits were built up over eons. When you see the strata of the red rocks, you are witnessing 180 to 220 million years of geologic history graphically. The cliff dwellings at Montezuma's Castle National Monument date back to 700 A.D. Many tribes: the Sinagua, the Hopi, Navajo, Hohokam and even the Apache came through here in their nomadic travels. Most were gone by 1400. 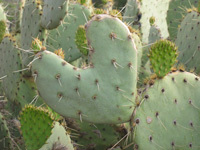 Fruit farmers and cattle ranchers settled in the Oak Creek area in the 1800's for the water and the proximity to the mountain town of Flagstaff, the military outpost in Camp Verde and the active mining town of Jerome, 25 miles to the west. By early 1900, Carl and Sedona Schnebly came from Missouri to homestead here. Sedona loved the simpler, if more demanding life in the Wild West and hosted many people in her home. This hospitality led to their opening the first hotel on the present site of Los Abrigados on Oak Creek near the bridge. When Carl became the local Postmaster, he submitted two names, including Schnebly Station. They were both rejected as being too long to go on a cancellation stamp, and friends suggested instead his wife's name, Sedona. A much better choice than Schnebly Station, don't you think! Sedona is home to about 150 resident artists, many lovers of the good life, a large retired population and many who came here for the spiritual transformation that it engenders. There are about 22 churches here, with all major religions represented, many nondenominational churches, and spiritual and metaphysical people with wide-ranging beliefs. Many people continue to land here, "quite by accident" and end up with"'Red Rock Fever" ... the only known cure for which is to move here! Sedona continues to attract very talented people from all walks of life as the fabric of this society continues to be enriched by all who come here. 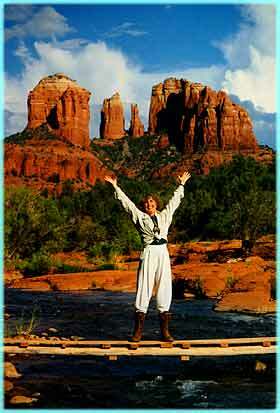 Is the spirit of Sedona calling you?